You might think that a crumbly scone with sweet glaze is the kind of thing that's a) too decadent to be enjoyed guilt-free and b) too difficult to whip up without a culinary degree. We're here to inform you you're wrong on both counts... Yippee! Spread butter into a 1/4-inch-thick layer on a piece of parchment paper or aluminum foil. (If needed, let it come to room temperature so it's easily spreadable.) Freeze until solid, at least 2 1/2 hours. 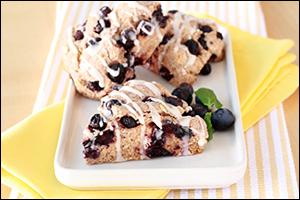 In a large bowl, combine flour, sweetener, oats, baking powder, cinnamon, and salt. Mix well. Form dough into a circle on the baking sheet, about 6 inches in diameter and 1 inch thick. Evenly slice into 6 wedges, but don't separate the wedges. Bake until a toothpick inserted into the center of a scone comes out clean, 24 - 26 minutes. Once scones are cool, to make the glaze, combine powdered sugar, soymilk, and remaining drop of vanilla extract in a medium bowl. Stir until smooth. 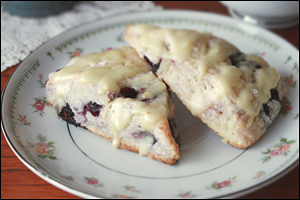 Separate scones into wedges, drizzle with glaze, and enjoy! HG Alternative: Swap out the Splenda for the same amount of granulated white sugar, and each serving will have 206 calories, 37g carbs, and 18.5g sugars (PointsPlus® value 5*). Don't let your pals hit Starbucks or Panera Bread without this super-helpful info... Click "Send to a Friend" now! Today, May 13th, is National Fruit Cocktail Day. If you go for the kind in a can, choose one packed in juice, not syrup. Better yet, try this fruit-salad inspired oatmeal parfait!